New York, NY (June 23, 2016) – Fareportal, a global leader in travel technology, announced that it has acquired tripcombi, the German-based metasearch website that specializes in sourcing affordable flights. The acquisition of tripcombi, formerly known as tripdelta, expands Fareportal’s global portfolio of travel brands. “tripcombi is a great resource for travelers worldwide who are looking for opportunities to search for a wide choice of airfares at affordable price points. “This acquisition elevates the Fareportal brand, and will strengthen its presence in Europe,” said Sam S. Jain, Fareportal Chief Executive Officer. tripcombi is a travel technology company offering travelers the ability to find unique flight itineraries at affordable rates, which are in many cases, cheaper than what is found on competitor metasearch engines. Like Fareportal’s other brands, tripcombi provides consumers with user-friendly search features to seek and secure affordable flights quickly and with ease. Fareportal’s acquisition of tripcombi complements the company’s overall customer service offering giving consumers the opportunity to conveniently choose and book affordable air travel. “Our goal at tripcombi is to provide a flight search platform that offers travelers every possible option for affordable flights in only one search, a mission that is aligned with Fareportal’s search model. This acquisition is an organic fit for both parties,” said Nikolas Langes, Co-Founder & Managing Director at tripcombi. Customers can begin using tripcombi’s metasearch to source and book their travel now by visiting www.tripcombi.com. tripcombi, formerly known as tripdelta, is an online flight metasearch platform that can save consumers up to 80% in airfares compared to competitors by leveraging its proprietary technology to find unique flight combinations. Tripcombi’s technology is built upon unique machine-learning algorithms that empower end users to search and find competitively priced flights that are hard to come by. To learn more about tripcombi, visit www.tripcombi.com/en. NEW YORK, NY (June 20, 2016) – Fareportal and its subsidiary CheapOair have been honored with three of the biggest and most prestigious Stevie Awards from the American Business Awards program including the Gold Stevie for Fareportal’s Customer Service Department and two awards for CheapOair’s website and mobile app. “We are extremely humbled by this peer recognition as the Stevie Awards are considered the world’s premier business awards,” noted Sam Jain, CEO of Fareportal. The Stevies were created in 2002 to honor and generate public recognition of the achievements and positive contributions of organizations and working professionals worldwide. The American Business Awards are open to all organizations operating in the U.S.A., and feature a wide variety of categories to recognize achievement in every facet of the workplace. More than 3,400 nominations were submitted to this year’s American Business Awards for consideration in a wide range of categories, including New Product or Service of the Year, Most Innovative Company of the Year, Management Team of the Year, Best New Product or Service of the Year, Corporate Social Responsibility Program of the Year, and Startup of the Year, among others. More than 250 judges participated in the competition review. Fareportal was presented with the Gold Stevie for the Customer Service Department of the Year. The Stevie Awards for Sales & Customer Service are open to all organizations worldwide, and recognize the achievements of sales, customer service, and call center professionals. Fareportal’s unique high-touch, hi-tech capabilities in the travel industry and their impressive contact center are vital to their success. Fareportal’s customer service department receives over 30,000 daily calls, manages over 450 emails and handles over 800 instant messages per day. In addition, the companies abandoned calls have decreased by 5% since 2014 due to protocols and procedures set in place so that these rates continue to decrease in the years to come. All of Fareportal’s customer service centers are operated in-house. CheapOAir has also been named a Silver Award winner in the category of Travel Apps. In October 2015, CheapOair launched its Predictive Home Screen on IOS Apps, a travel application offering simple navigation for customers who want to easily check their flight status, upgrade their trip or purchase extras. In addition, the application has interconnectivity with the Apple watch, allowing travelers to access the Predictive Home Screen right on their wrists, making CheapOair a true travel companion. Since the launch of the Predictive Home Screen, the app has been downloaded more than 1 million times and has received positive feedback for its design, interface and rankings. “CheapOair uses cutting edge technology to make it effortless, affordable and enjoyable for our customers to book their perfect trip,” said Sam Jain, CEO of Fareportal, the parent company of CheapOair. CheapOair also won the Bronze Stevie for its Consumer Friendly Homepage as one of the best home/welcome pages. As a leading hybrid (online/traditional) travel agency, CheapOair strives to remain ahead of the curve with periodic enhancements to ensure that CheapOair.com is the primary go-to resource for consumers booking travel. Aside from daily updates, CheapOair.com provides a fast and simple booking path, features a live chat, allows consumers to check their flight status, conveniently provides CheapOAir’s customer service number on the homepage and provides customers with a quick and easy search/booking process with three simple clicks, compared to the standard industry protocol of the 5+ clicks. 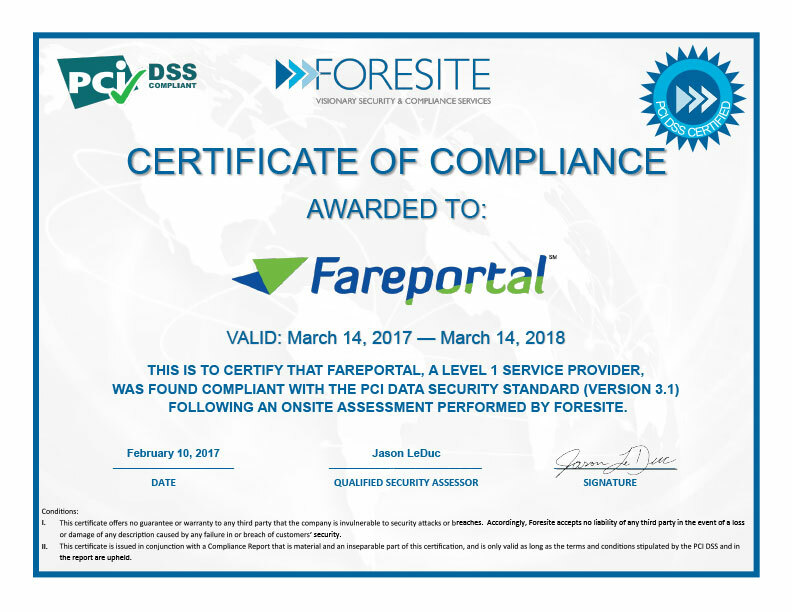 “Once again, Fareportal’s company focus on technology enables CheapOair to provide a website, mobile apps and services that give our customers the ultimate service they expect,” said Jain. 2016 Stevie winners were celebrated and presented their awards during a gala event on Monday, June 20 at the Marriott Marquis Hotel in New York. The presentations were broadcast live via Livestream. Past Stevie Award winners including Apple, Ford Motor Company, Procter & Gamble, Samsung, among many others. The Stevie® Award trophy is one of the world’s most coveted prizes. Since 2002 the Gold Stevie Award has been conferred for achievement in business to organizations and individuals in more than 60 nations. The name Stevie is taken from the name Stephen, which is derived from the Greek for “crowned.” The Gold (soon to be Grand) Stevie is approximately 16 inches tall, and is hand-cast and finished in 24-karat gold. The crystal pyramid held aloft by Stevie represents the hierarchy of human needs, a system often represented as a pyramid that was developed in the 1960s by psychologist Abraham Maslow, who observed that after their basic needs are met, human beings seek the esteem of their peers. Stevie Awards are conferred in seven programs: the Asia-Pacific Stevie Awards, the German Stevie Awards, The American Business Awards, The International Business Awards, the Stevie Awards for Women in Business, the Stevie Awards for Sales & Customer Service, and the new Stevie Awards for Great Employers. Stevie Awards competitions receive more than 10,000 entries each year from organizations in more than 60 nations. Honoring organizations of all types and sizes and the people behind them, the Stevies recognize outstanding performances in the workplace worldwide. Learn more about the Stevie Awards at http://www.StevieAwards.com. CheapOair recognized as a global leader in air bookings for China Airlines for the second consecutive year. NEW YORK, NY – June 16, 2016 – CheapOair, a leading hybrid travel agency, announced today that it has received the Five Million Dollar Sales Award from China Airlines, Taiwan’s largest airline and one of the leading airline carriers in Asia. The Five Million Dollar Sales Award, presented to CheapOair on May 24, 2016, recognizes CheapOair for attaining ticket sales of $5 Million dollars or more and its overall achievement as a global leader in travel. “This is a proud moment for CheapOair. 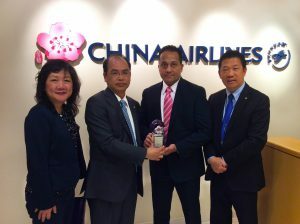 We are excited to be honored with the Five Million Dollar Sales Award for the second consecutive year from China Airlines,” says Sanjay Hathiramani, Senior Vice President of Supplier Relations at CheapOair. “We consider this recognition a sign of our commitment to providing our customers with an effortless, affordable, and enjoyable booking experience”. 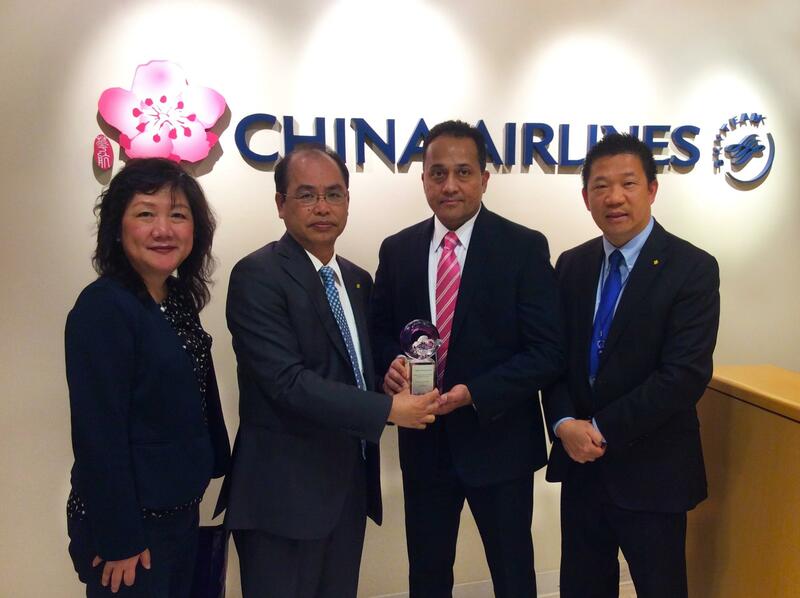 Presented at the China Airlines regional office in New York City, this award acknowledges CheapOair’s sales achievements as well as its success in coordinating and booking travel on behalf of its customers on and offline. China Airlines is Taiwan’s National Carrier and Sky Team Member. Its North American Region Gateways are Vancouver, Los Angeles, San Francisco, New York (JFK) & Honolulu, with Boeing 777-300-ER fleets service from New York ( JFK ), San Francisco & Los Angeles. China Airlines Premium Business Class has won the Best of the Best Award from Red Dot. CheapOair is the first hybrid (online/traditional) travel agency that enables consumers to book travel online, on mobile apps, by phone or live chat. CheapOair (www.cheapoair.com, 1-800-566-2345) bridges the gap between an online and traditional travel agency with certified travel agents available 24/7 to help find deals and offers to destinations worldwide on over 450 airlines, 150,000 hotels, and hundreds of car rental companies. Partner airlines benefit from access to CheapOair’s broad customer base that books high yield international travel and add-on ancillaries. Follow CheapOair on Facebook and Twitter to learn how to travel the world for less. NEW YORK, June 15, 2016: CheapOair, a leading flights-focused hybrid online travel agency, announced today the top ten domestic and international destinations its consumers are traveling to for the 4th of July holiday. Data shows that travelers are taking advantage of lower airfare prices, which are expected to last throughout the peak summer travel season. The largest price decrease seen between 2015 and 2016 for domestic destinations was reflected in bookings for Chicago, IL, showing a 19% overall decrease in airfare costs. CheapOair’s data further shows that those who may be looking to pay the lowest price for their trip should consider Atlanta, GA, as a destination, as the average airfare costs $271. Orlando, FL came in as the most popular destination for the holiday, with a 16% decrease in airfare, rounding out at $294. For international destinations, Cancun was ranked as the number one destination for this time of year but saw a slight price increase of only 1%, adding on $6 from last year’s average price. According to CheapOAir data, Belize had the largest decrease in airfare costs by far, dropping a total of 38% since last year, and Mexico City had the lowest airfare for a roundtrip, at a price of $396. *The fares referenced are averages, based on bookings made beginning January 1st, for travel anytime between June 26th and July 11th, 2016. Travelers can sign up to receive daily travel deals to various destinations, including the top Independence Day Holiday getaways for 2016, by making a CheapOair profile at CheapOair.com. For more information, please visit CheapOair.com, CheapOair.com/mobile, or check out CheapOair’s Miles Away blog for travel tips and trends. CheapOair is a flights-focused hybrid travel agency that enables consumers to book online, on mobile apps, by phone, or live chat. CheapOair (http://www.cheapoair.com, 1-800-566-2345) bridges the gap between an online and traditional travel agency, with certified travel agents available 24/7 to help find deals and offers to destinations worldwide on over 450 airlines, 150,000 hotels, and 100s of car rentals. Partner airlines benefit from access to CheapOair’s broad customer base that books high yield international travel and add-on ancillaries at above the industry average. Follow CheapOair on Facebook and Twitter to learn how to travel the world for less.